To have Caroline Lucas, Britain’s first Green Party MP, delivering this year’s Kelmscott Lecture in the Coach House was indeed to feel that that venue had been restored to its 1880s/90s purpose as a debating hall for pressing contemporary political concerns. The debate took place not so much in the lecture itself, which was a lively overview of Morris’s manysided aesthetic and political commitments, as in the questions and answers that followed, many of which focused on prospects for Green politics in our own time. For me, Lucas’s talk was a chance to reflect on my own relation, as a Morrisian, to the Green Party. Having been a member since about 1993, I put in two very intense years of local campaigning for Lancaster Green Party in 1997 and 1998, and accordingly got elected as one of Lancaster’s first-ever Green city councillors in May 1999, standing down at the end of my four-year stint in April 2003 (though the local Party successfully defended what had been my seat). I felt then that in the Green Party one could both be a full-blooded socialist and engage people’s pressing everyday concerns – housing, transport, recycling, anti-social behaviour; but my confidence that I could reconcile those two frameworks there has dwindled since. 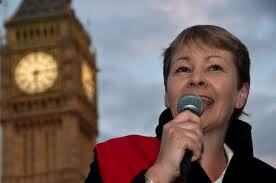 In her Kelmscott Lecture Caroline Lucas mentioned the word ‘capitalism’ only once, and that to me is the problem. In the light of global economic crisis since 2008 (and with general strikes taking place in Spain and Portugal as I write), I’ve come to feel that Green politics and socialism are quite different things. The former is an essentially ethical appeal for lifestyle changes in the name of a universal interest - the survival of human life on this planet - while the latter addresses a class interest against a class enemy in the name of the overthrow of the existing economic system. Yes, certainly, there is some overlap here: capitalism is committed to endless growth and thus threatens the environment too. But though Caroline Lucas herself probably is a person of the Left, I have ceased to believe that the UK Green Party as a whole is or can ever be a party of the Left; and that is why, regretfully, I am a member of it no longer. Ah, I was hoping that Green Party friends disappointed that I'd left the Party might offer a defence of membership in it here. The invitation to do so still stands!